Although there are several visa categories for international students in the United States (including J and M categories), the majority of international students enrolled in US colleges or graduate schools are under the F1 visa program. Under the F1 Visa, students are allowed to work under OPT. 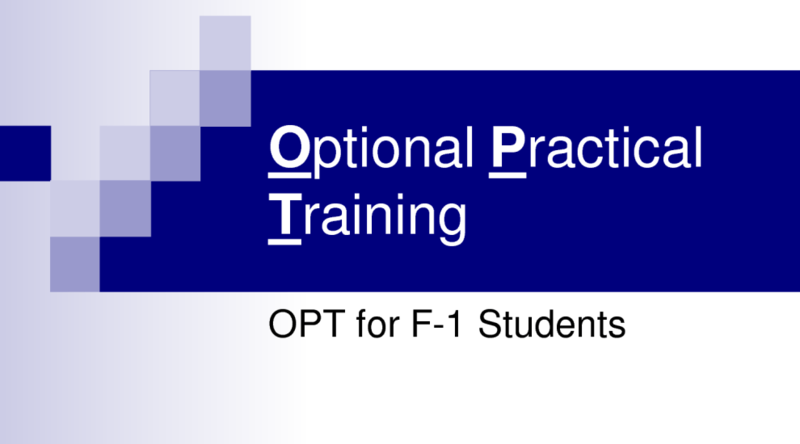 Optional Practical Training (OPT) is a period during which undergraduate and graduate students with F-1 status who have completed or have been pursuing their degrees for more than nine months are permitted by the USCIS to work towards getting practical training to complement their field of studies. The F1 visa is very flexible and largely administered by the school, in conjunction with the United States Citizenship and Immigration Service (USCIS). What Work Privileges Are Available on OPT? Under an F1 visa, students can complete their entire degree, and they have certain rights to work while they are on a valid F1 status. While there is some right to work under OPT while still in college (“pre-completion OPT”), the main use for OPT is the right to work for 12 months after completion of a degree (“post-completion OPT”). So as you near graduation, you can apply for OPT, which will permit you to work for any employer in the US (subject to all of the rules of OPT). You can apply for a new OPT period for each new degree level you complete – for instance, if you receive a Bachelor’s degree, you can apply for OPT and work for a year, go back to graduate school, then when you complete your Masters or PHD, you can apply for OPT again and work for another year (many students actually do this). One twist to OPT is that students who have graduated from a US college or university with a specific degree in the STEM fields – science, technology, engineering and mathematics – can apply to extend their OPT for an additional 17 months, bringing their total post-graduation OPT available time up to 29 months. Applying for OPT is a technical process, one in which you will need to be aware of all deadlines, solicit the help of your international student center and otherwise be on top of the requirements. It’s easy to mess it up! And if you do, your chances of finding a job in the US will certainly be reduced. You must have been enrolled in school in the US for at least 9 months before you can apply for any OPT (pre or post-completion). You can apply for post-completion OPT as early as 90 days before graduation, and up to 60 days after graduation. On the application itself, you will indicate the desired start date for your employment. You cannot start to work before you have received your Employment Authorization Document (EAD) from USCIS, and not until you have been in the US for at least 12 months. Since USCIS can take some time to act on your request and get your EAD to you, you should apply for OPT as early as possible. You do not need to have a job lined up yet to apply.